Heir of an ancient heritage, the Piment d’Espelette is the fruit of loving attention and exclusively hands-on methods of production. Planted in the spring, the Piment d’Espelette is picked by hand as soon as the fruit turns red, from August to the 1st of December. The process, from the seed to the final powder, follows very strictly laid down processes. 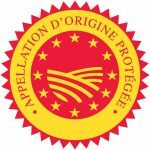 Cultivated in the fresh air, on small plots, the production of the Piment d’Espelette is respectful of the environment ; irrigation and the use of pesticides are strictly regulated. From the beginning of 2000, with the acquisition of the PDO quality labels, the will of the producers is to protect their spice and its precious harvest. 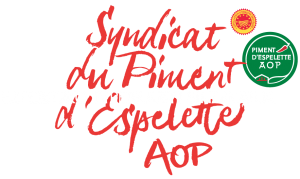 Today the Piment d’Espelette is the first and only spice in France with these quality labels. The chilli came to France from Mexico with Christopher Columbus in the 16th century. 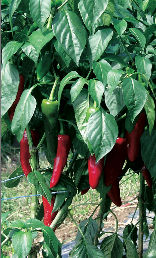 In 1650, finding a climate similar to its place of origin, the chilli found its new roots in the area around Espelette. It was quickly used as a condiment and for preserving meats. The seeds from the best plants were chosen and kept to be sown the following year. 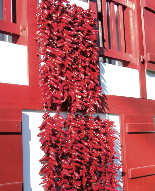 By using traditional methods of drying on the facades of the houses, the Piment d’Espelette is now recognized as the emblem of the Basque Country. The Piment d’Espelette awakens your senses. Whether corded or as powder, all batches are scrupulously examined by a panel of expert tasters before being awarded the PDO labels. A cord is composed of at least 20 Piments and corded on the farm. As for the powder, it is 100% Piment d’Espelette. Manufactured exclusively from Piments from the same producer, it contains no artificial colorants, nor additives or preservatives. 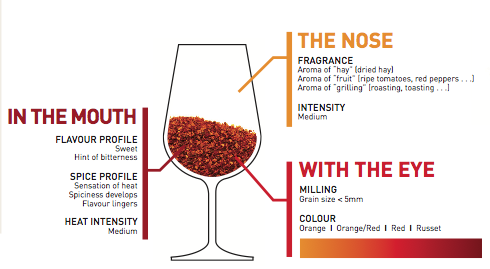 The eye, the nose, the mouth, the Piment d’Espelette PDO is a spice under close scrutiny. The Piment d’Espelette is a welcome guest at your table. Its perfume and colour will embellish every day cooking as well as more refined dishes. 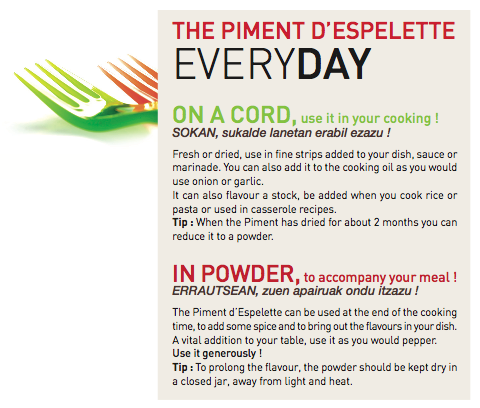 An ally for the gourmet, the Piment d’Espelette can be used from starter to dessert. In cords or in powder renowned chefs enjoy creative cuisine with this especially tasty spice. 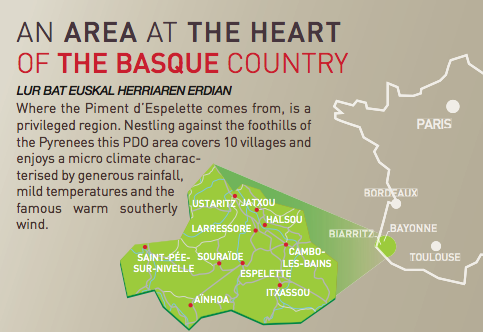 In the Pays Basque we salt and Espelette ! At the heart of the village of Espelette, come and discover the world of the Piment d’Espelette. Guided visits, displays and tastings are offered by our producers and local volunteers.